This entry is part of an ongoing series. Read Part 1, Part 2, and Part 3. Walruses are huge sea mammals, that I found grotesquely cute in person. Their scientific name, Odobenus rosmarus means “tooth walking sea horse” which aptly describes their awkward movement on land. Walruses are divided into two subspecies, the Atlantic and Pacific, and are built for the cold marine habitat with a thick layer of blubber and sensitive whiskers for detecting shellfish on the ocean floor. While walruses are at home in the water, they haul out on ice floes or land to rest, molt, and care for their young. Close proximity to feeding grounds and smooth gentle beaches make Sand Island in NE Greenland a preferred haul-out for the local walruses. Dr. Erik Born, the Danish scientist who invited to me Sand Island, began studying walruses in 1977. His project for our field season was surveying the local walrus population through skin biopsies (for DNA samples), as well as deploying a few satellite tags. Erik has data from previous years and his goal is learn how many individuals are in the region and whether the population is growing or in decline. The information will primarily be used by Greenland to manage sustainable hunting quotas, and may also reflect the greater environmental changes occurring throughout the Arctic. 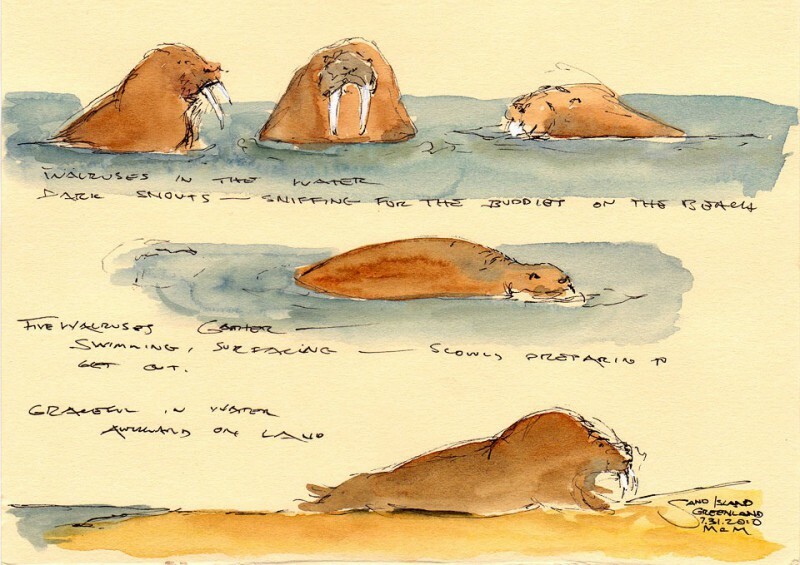 Learn more about walrus research through this short video which features field audio, sketches, and photographs! Erik also tagged five walruses with satellite transmitters mounted on a barbed tip lodged in the very thick skin (over 2″) of the animals. The tag is ideally placed in the upper back of the animal, using a CO2 rifle. 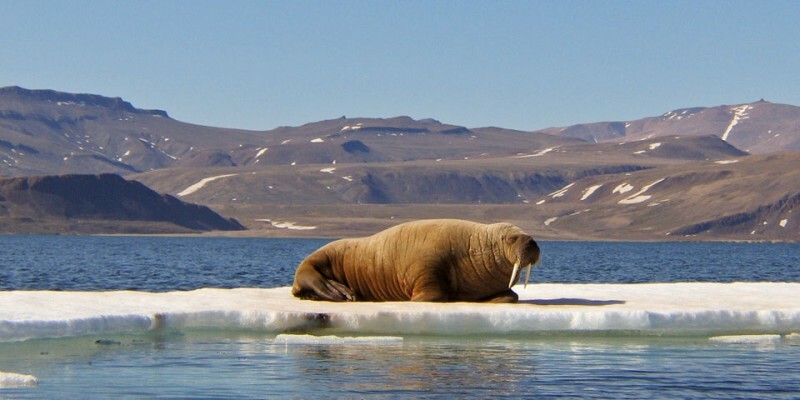 When the walrus surfaces to breathe, the transmitter sends data to satellites that may be used for tracking the animal’s location. The tags typically fall off within one month and walrus skin heals rapidly. 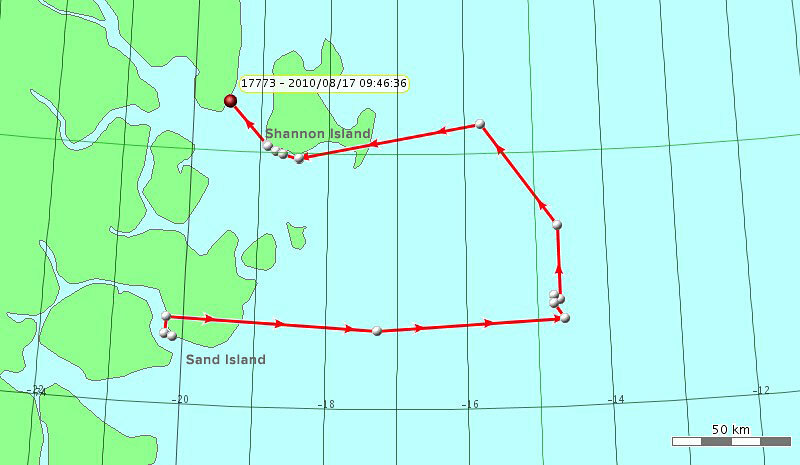 This diagram shows the movement of one walrus over ten days as it left the feeding grounds near Sand Island and headed north towards Shannon Island. I never forgot working around the walruses that they are huge, wild animals with dangerous tusks. The fieldwork though, was fairly relaxing since the animals predictably return to Sand Island and move slowly on land. Here’s a short video I made of one on its way from the beach to the water. Enjoy! ps. It eventually reached the water, but only after a long rest. Very, very interesting. Nicely done Maria! What do walruses smell like? Ha! Imagine smelling a cross between a horse barn and the ocean- walruses can be a bit pungent. Check out my video on sketching in the North Cascades! How I prep for large scale watercolors including a studio timelapse. This is the first in a series of paintings exploring Arctic Terns’ movement. This painting continues my themes of saturated colors and Arctic Terns. 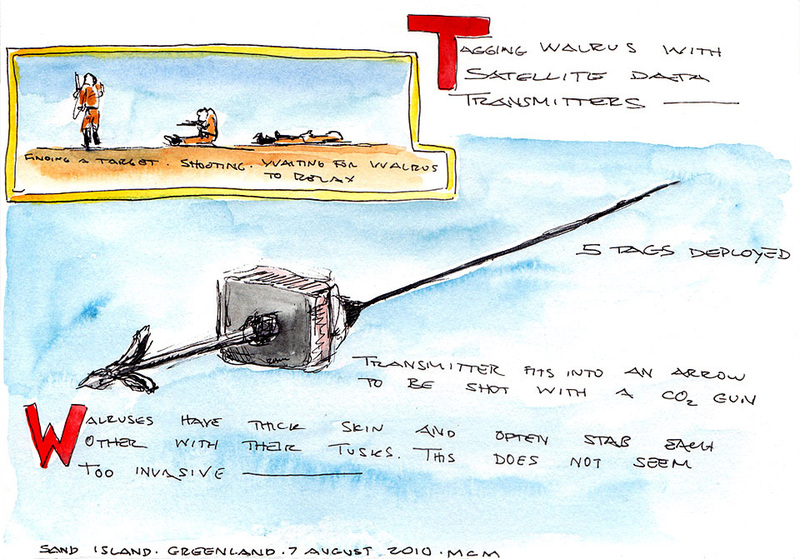 This 5″x5″ sketch is inspired by my travel along the NE Greenland coast. The incredible migration of Arctic Terns between the Arctic and Antarctica continues to inspire me.